Why are we interested in finding the particular interest rate that equates a project's cost with the present worth of its receipts? Again, we may easily answer this by examining Figure 17.3.2. In this figure, we notice two important characteristics of the NPW profile. First, as we compute the project's PW(i) at a varying interest rate (i), we see that the NPW becomes positive for i < i*, indicating that the project would be acceptable under the PW analysis for those values of i. Second, the NPW becomes negative for i > i*, indicating that the project is unacceptable for those values of i. Therefore, the i* serves as a break-even interest rate. By knowing this break-even rate, we will be able to make an accept/reject decision that is consistent with the NPW analysis. FIGURE 17.3.2 A net present worth profile for the cash flow series given in Figure 17.3.1 at varying interest rates. The project breaks even at 58.43% so that the NPW will be positive as long as the discount rate is less than 58.43%. 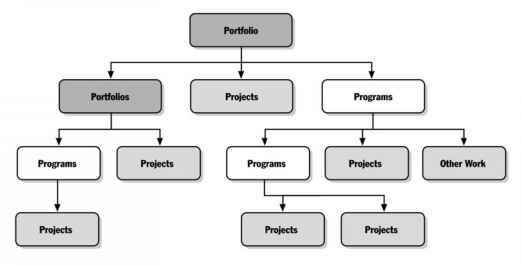 * When applied to projects that require investments at the outset followed by a series of cash inflows (or a simple project), the i* provides an unambiguous criterion for measuring profitability. However, when multiple rates of return occur, none of them is an accurate portrayal of project acceptability or profitability. Clearly, then, we should place a high priority on discovering this situation early in our analysis of a project's cash flows. The quickest way to predict multiple i*s is to generate a NPW profile and check to see if it crosses the horizontal axis more than once. In addition to the NPW profile, there are good — although somewhat more complex — analytical methods for predicting multiple i*s. Perhaps more importantly, there is a good method, which uses a cost of capital, of refining our analysis when we do discover multiple i*s. Use of a cost of capital allows us to calculate a single accurate rate of return (also known as return on invested capital); it is covered in Contemporary Engineering Economics, C.S. Park, Addison-Wesley, 1997. 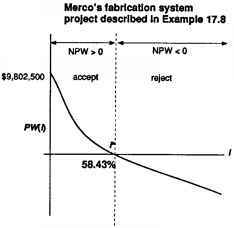 If you choose to avoid these more complex applications of rate-of-return techniques, you must at a minimum be able to predict multiple i*s via the NPW profile and, when they occur, select an alternative method such as NPW or AE analysis for determining project acceptability. 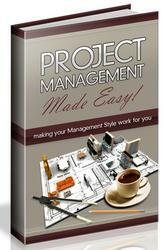 Note that this decision rule is designed to be applied for a single project evaluation. When we have to compare mutually exclusive investment projects, we need to apply the incremental analysis, as we shall see in a later section.